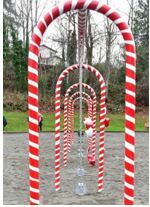 Once again, the Swing Set Specialist would like to say a big congratulation to all the people involved in working on the new Candy Cane Swing set project for Terrace Creek Park. A ribbon was cut to officially open the new “Candy Cane” themed Swing set and many people attended such as members of a local Girl Scout troop, an Eagle Scout candidate and city dignitaries who played a big role in getting this project over the line. Members of the Girl Scout Troop 41246 included Neeva Shrestha and Holland Hornaday with Troop Leader Heather Margo who painted the new swing set while retaining the park’s candy cane theme. The old swing set has been removed now and a large team installed the newly painted equipment, and over 25 volunteer boy scouts and parents helped to complete the installation. Again, we would like to congratulate all those who helped with this particular project and we hope it gives years of great joy and fun for kids in the local community for many years to come. Posted in Media Stories and tagged Candy Cane Swing set Terrace Creek Park, Candy Swing set Terrace Creek Park, Terrace Creek Park swing set.